The Ottawa Senators have made their fair share of trades throughout their history. Some of those moves have seen them come out on top, but others have fans wondering what just happened. As with any NHL team, the return a team can get for a particular player or pick can vary a great deal. Are they buyers or sellers at the trade deadline? Is the organization in a rebuild? Did the player ask to be traded or was a player causing issues for the team, like what happened with Dany Heatley and Mike Hoffman? The answers to these questions can drastically change the return a general manager can get in a trade. Luckily for the Senators, they’ve had a number of transactions that saw them come out on top. Some of the greatest players of all-time for the team have come through trades, whether straight up hockey trades or through draft picks. Here are the three top swaps in Senators history. In January of 1996, the young Senators organization obtained what would be one of the most prolific players in team history. Defenseman Wade Redden would go on to play 11 seasons in Ottawa, helping the team to their only Stanley Cup Finals in 2007. He also helped the team to the playoffs in 10 of his 11 seasons. Redden remains fifth in Senators history for points (410) and first in plus/minus (159). The alternate captain for nine seasons only finished one season as a minus, in 1999-00 (-1). The other pick up for Ottawa was goaltender Damian Rhodes who played for the Senators for four seasons. While not particularly memorable for most fans, Rhodes did help the club to their first playoff series win and was also credited with a goal in a 6-0 win over the New Jersey Devils. To the Islanders, Bryan Berard played just two and a half seasons, Martin Straka played 22 games and Don Beaupre never played. The Sens came out big in this trade with Redden, who would remain arguably the teams best defenseman of all-time until the team made the number two trade on this list for a young player by the name of Erik Karlsson. In 2008, the Senators stole Erik Karlsson from the Nashville Predators. On day one of the 2008 NHL Draft, Ottawa sent their 18th overall pick and a third round pick to the Predators. In exchange, they got the 15th overall pick and chose, now captain, Erik Karlsson. From that day, Karlsson has gone on to become the best defenseman, possibly even best player, in team history. The Swedish defender has played 627 games for the team over nine seasons, collecting 518 points in the process. That total is third most in Sens history and best for an Ottawa defenseman. 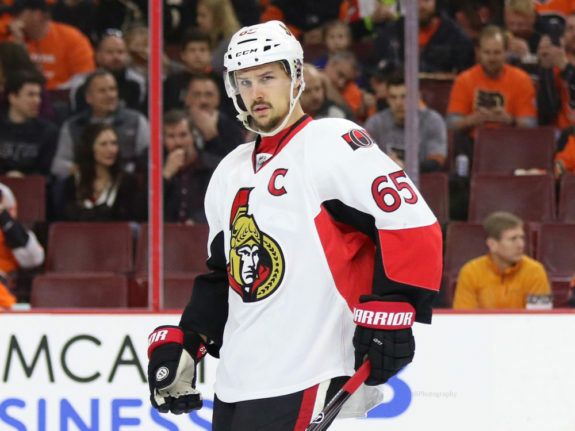 The return for the initial Karlsson trade is much less then is expected in his recent rumours. With the 18th pick, the Predators chose Chet Pickard, who never played an NHL game. The third round pick was used to select Taylor Beck, who only dressed up for 85 games in Nashville. The Predators got lucky that year in drafting stud defenseman Roman Josi with the 38th overall pick, which they received in a trade from the Phoenix Coyotes. But imagine if Shea Weber and Erik Karlsson were on the same team, with Pekka Rinne in net? The Senators may have saved the NHL from a potential Stevens-Niedermayer-Brodeur dynasty in Tennesee. The New York Islanders shouldn’t trade with the Senators. If the Redden trade was bad for the Isles, this trade was terrible for them. But for the Senators, it was the biggest steal to date. For giving up Alexi Yashin in 2001, the Sens received a number one defenseman and a number one center for years. Yashin, while a star for a short time in Ottawa, was a sore spot for the organization. He disappeared in the playoffs every year and sat out the 1999-00 season in one of his numerous attempts to renegotiate his contract. After the trade, he played well with the Islanders for five seasons before leaving for the KHL. The Senators, however, became a threat in the league. On top of the Stanley Cup run in 2007, the team won the division three times over the next five seasons, including leading the league in points in 2002-03. 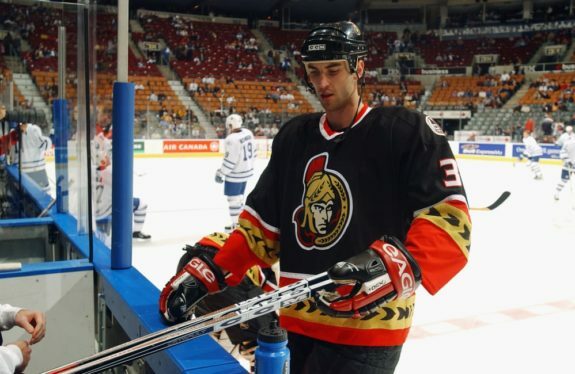 The 6-foot-9 Zdeno Chara became one of the league top defenders, and the 2nd overall pick became the Senators first home-grown star, Jason Spezza. Like Chara, Spezza became one of the leagues best while centering Daniel Alfredsson and Dany Heatley. He would also become the team’s captain after Alfredsson’s departure. The third acquisition for the Sens in this trade kept it from being a complete rip-off. Bill Muckalt played one season for the Senators, infamously failing to record one goal. With or without Muckalt though, this trade is the most lopsided in Senators history.